Welcome to TBSPedia, the online resource for the Tahoe Backcountry Ski Patrol and all users of the Tahoe Backcountry! Learn more about the patrol and our activities. 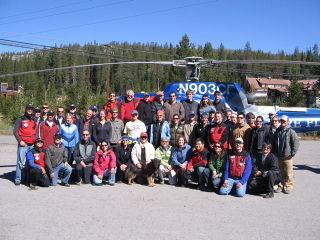 News articles and press clippings about Tahoe Backcountry Ski Patrol. Read up on the policies and protocols of the Tahoe Backcountry Ski Patrol. Introduction to the Tahoe Backcountry Ski Patrol! Instructions for prospective candidates. Schedule an on-the-snow introduction to backcountry patrolling. Links for our Avalanche course students. Links for up to date weather, traffic and avalanche information. Links for physical conditioning, tree-well immersion, etc. Information and Signup Instructions for the Search and Rescue Team. Bulletin board for posting items needing attention, or volunteering to fix it!. Information on how and why to become a Senior Patroller in TBSP.